In the age of artistic pluralism, traditional media tend to be looked down at. Who does paintinganymore, when you can make an installation, a digital something, and consequently, make a bigger impact? Painting is taken for granted. Painting is said to be dead. But if we disregard the auction room success of oils on canvas, and look at painting as just a medium, it becomes clear that it’s actually far from dead. Painting is still, as it has always been, the truest test of an artist’s mastery, the supreme demonstration of skill in conjunction with thought, the historical heritage of generations of visual crusaders. So, when we hear – who does painting anymore, one answer comes up naturally, and it’s the one that leaves little room for comment. It’s David Hockney. 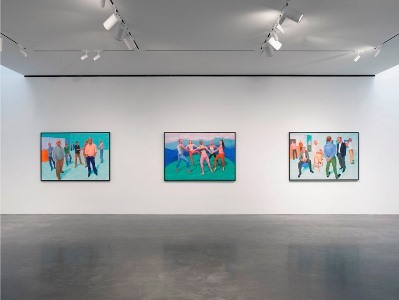 Some New Painting (and Photography) exhibition by Hockney opened about a month ago at Pace Gallery New York, as the first major painting exhibition by the artist since 2009. 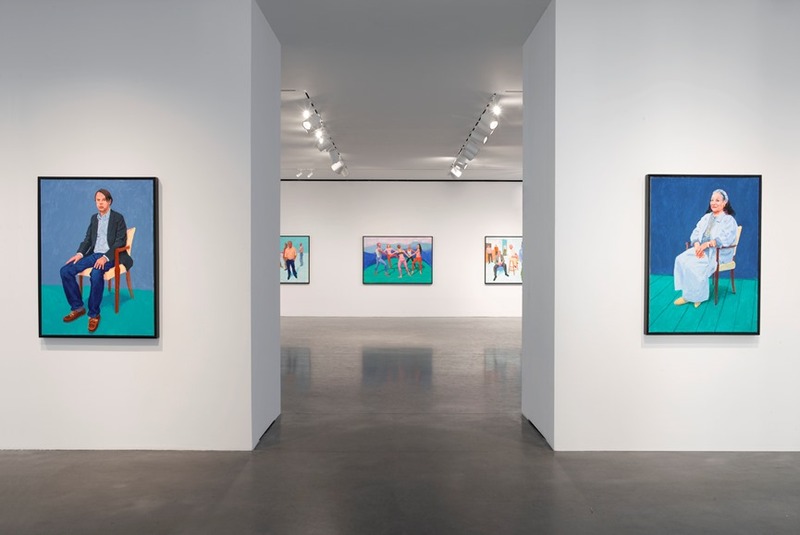 Presenting some new ideas in pictorial research, the exhibition is a premiere of Hockney’s works completed after the artist’s return from England to Los Angeles. Unlike the landscapes of East Yorkshire that pervaded his expression during the English decade, the painter returned to the study of human figure, which has taken over the dominant spot in the exhibition. 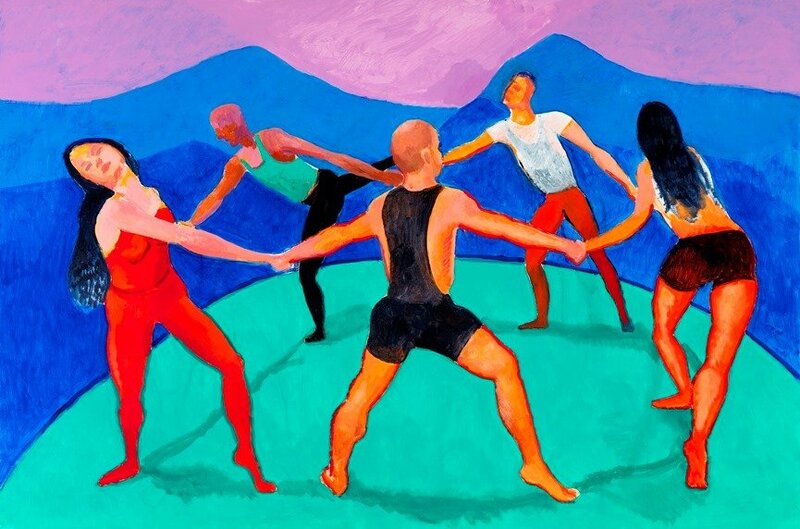 All of the pieces exhibited in New York have been completed in Hockney’s LA studio, using colleagues, friends, and dancers as models. Although the features of some of the models are recognizable, they are hardly relevant for the artist’s aim in the group scenes, while in the portrait scenes they play an important role. 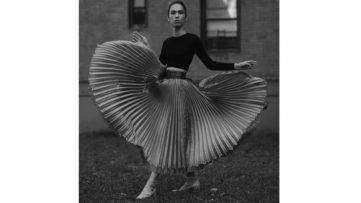 He moved his models around the studio, toying with the notions of space and time, repeating some of them more than once in a painting, in various poses. 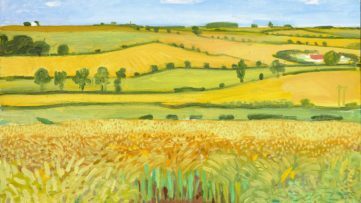 When observed after the vast Yorkshire landscapes, it appears that the painter is reliving the process of Degas, after engaging the series evoking Van Gogh. Profoundly engaged in visual study and the act of creation, Hockney has always been relatable to the masters of history of art in one way or the other. Some New Painting even contains an overt reference to a master, as Hockney executed a series of paintings inspired by Matisse’s Dance. What David Hockney did in these extensive explorations of spatial relations between the figure and the interior is, he placed them in various positions, representing different point of view for each of the models. This way, one painting contains unexpected, multiple angles of view, which create an interesting balance with a given perspective of the depicted space. All of the paintings are executed in a recognizable, vibrant palette of the British master, evoking the life, the sun and the purity of color. And Photography section of the show presents five photographic drawings shown on hi-def screens, combining drawings and photographs taken by the artist during the painting sessions in his studio. 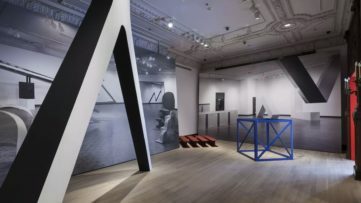 These works are in concordance with Hockney’s inclination to the use of new technologies in artistic creation, something he’s been working on since the emersion of fax machine, just to arrive to the recent iPad drawings, and consequently, drawing and photography combination. Brilliant works on show at Pace leave the observer amazed, not only by their pictorial quality and sweeping nature, but with the very wonderful spirit of David Hockney, who feels, by his own confession, as young as 30 when he works, just like Picasso. 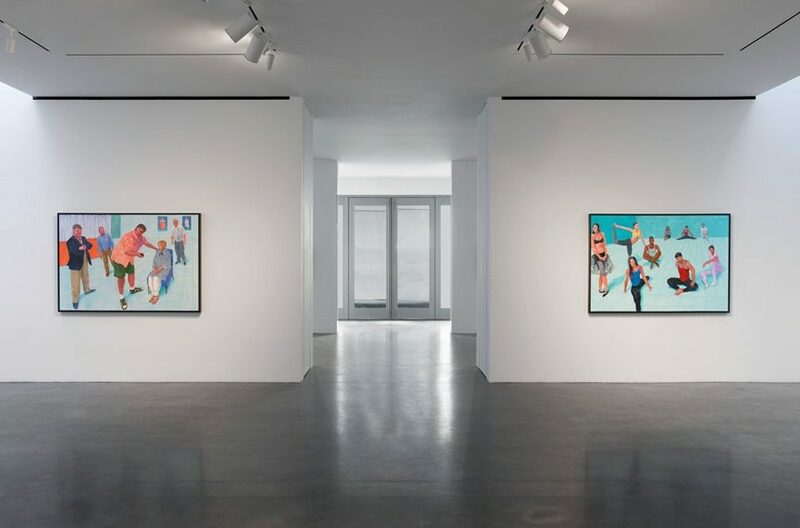 Some New Painting (and Photography) are on view now at Pace Gallery in New York, ending on January 10, 2015. All images: © 2014 Pace Gallery, All Rights Reserved. 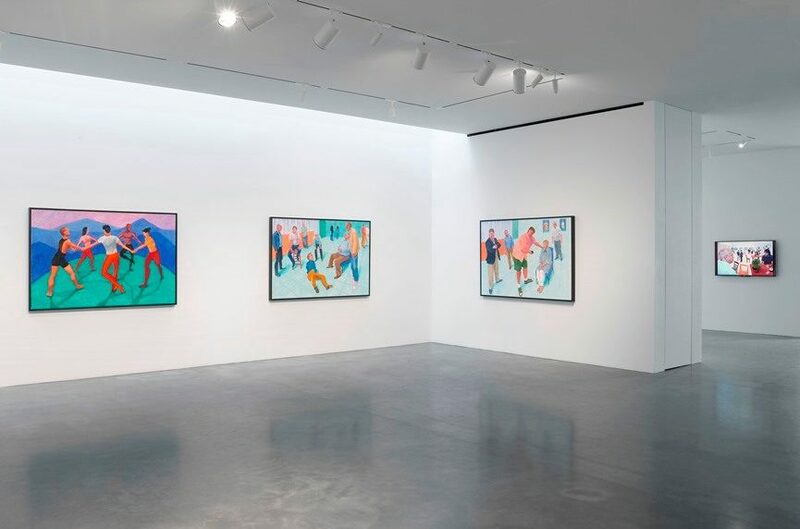 Featured images are: David Hockney – The Dancers IV, 14 August – 5 September, 2014; Installation View; Installation View; David Hockney – The Group X, 24 June – 2 July, 2014. 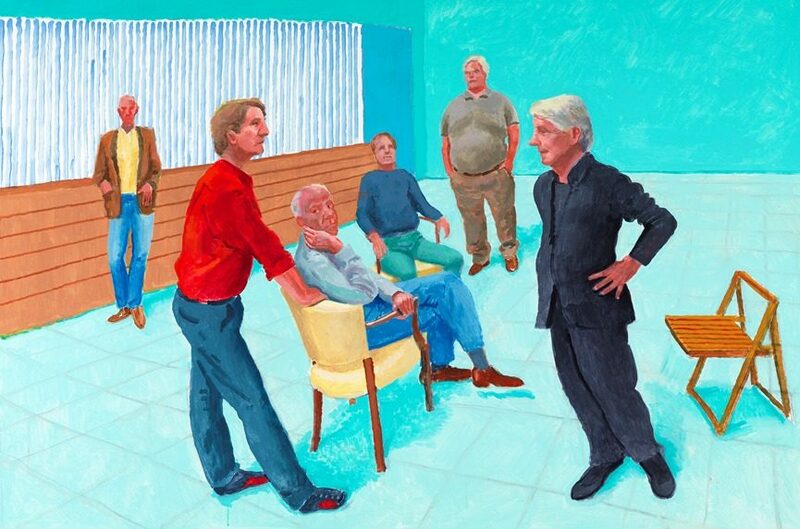 David Hockney’s works can also be found NOW at Art Basel Miami. Here’s how to tackle the fair! 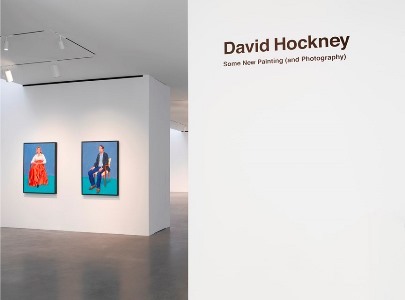 If you are in love with David Hockney’s work like I am, sign up for My Widewalls and stay in tune with all the artists you will adore just as much!